In launching its Keymission series of cameras, Nikon is bringing the fight to the doorstep of action cameras and VR camera makers. The cameras range from chest-wearable cams, borderline GoPro clones and the most interesting item of the bunch: 360-degree cameras. It’s an important shift at biannual Photokina photography trade show that is reflecting a rapidly changing photographic landscape. Nikon realizes that its markets are changing; while the company’s traditional bread and butter SLR cameras are still selling well to photojournalists and hard-core photography enthusiasts, sales have gone off a cliff. The problem is that new moms and college students, even if they’re interested in photography, aren’t buying the high-end cameras anymore. With KeyMission 360, Nikon picks a fight with the action camera market and the 360 degree photography markets. Waterproof to 30 meters, shock proof if it falls from head-height and backed with the Nikon seal of approval, it might just stand a proper chance. The camera shoots 360 video in 4K, which is starting to make the footage interesting for VR use as well. 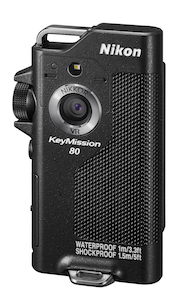 The KeyMission 80 looks like it lifted its design from a mid-1990s Olympus sound recorder. KeyMission 80 is a curiously designed chest-mountable camera that comes with a magnetic mount for quick access and photography in the moment. It has a front- and a rear facing lens for instant selfies. It’s waterproof and shockproof, of course and is aimed at outdoorsy types who somehow don’t want to take photos with their smartphones… So basically I can’t see anyone buying one, to be honest. KeyMission 170 is another curious beast and is probably the most direct competitor to GoPro’s range. Waterproof to 10 meters, it can shoot time lapses, 4K video and all the other things you’d expect from an action camera. Basically, it’s a yawn-inducing piece of kit (think GoPro with a Nikon label), but it is interesting for existing in the first place. The camera manufacturer finally admitting that this market is worth investing in is interesting. Nikon taking a leap into the action camera might prove to be too little, too late to take a meaningful bite out of the well-pounded paths of action photography. 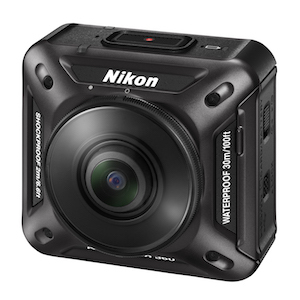 Nikon’s brand new KeyMission 170 is most similar to a GoPro. All the cameras include Nikon’s SnapBridge tech to make it easy to copy the footage to your smartphone for editing and sharing.